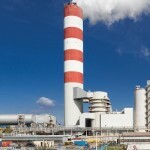 Two new coal fired power stations in Chile use New Chimney Design and find their chimneys undamaged after strong earthquake. Two important electricity generators in Chile, Endesa Chile and Colbun SA are constructing two, similar sized coal fired power stations near the city of Concepcion, some 500 km South of the capital Santiago. Both Endesa’s Bocamina 2 project and the Colbun 1 power station have capacities of 350 MW. Bocamina 2 uses a Wet Limestone FGD, whereas Colbun 1 uses Sea Water FGD. Both plants also have “New Chimney Design” FGD chimneys designed and built by Karrena, a division of BEROA. 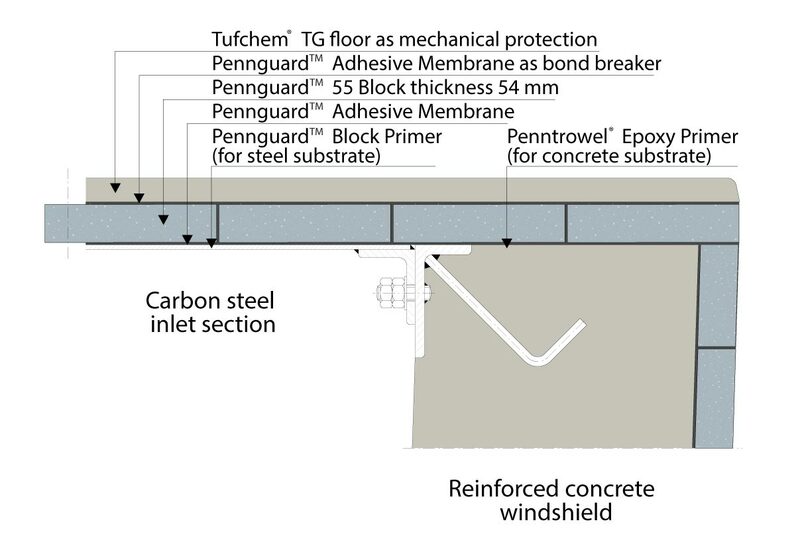 Bocamina Power Station has a 100 m high concrete chimney, protected by a 54 mm thick PennguardTM lining applied directly to its inside concrete surface. 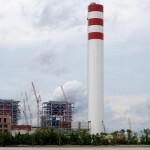 Colbun power station uses a 130 m high chimney with the same basic design as well as the 54 mm thick PennguardTM lining. Hadek’s New Chimney Design offers power station owners and builders a very efficient option for the construction of large chimneys. 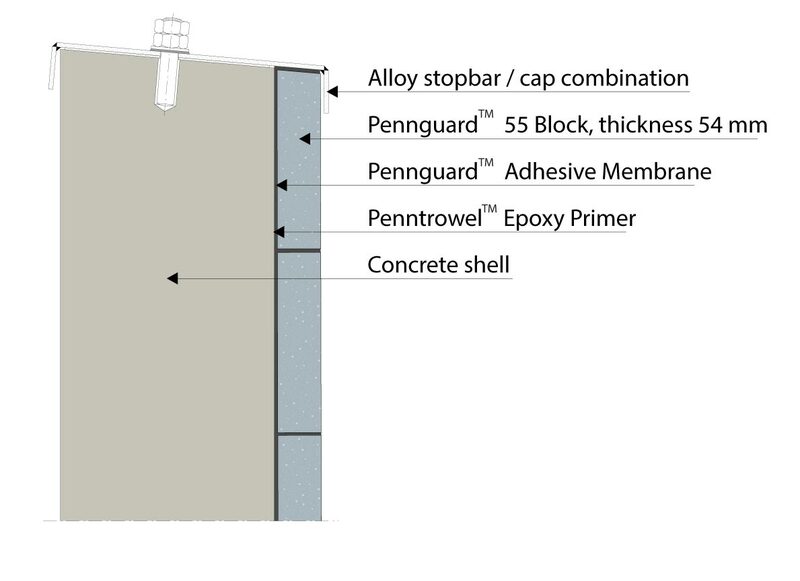 The New Chimney Design does not use any separate, internal flue but instead its concrete shell is kept slender and it is internally protected by a lightweight, insulating PennguardTM lining. 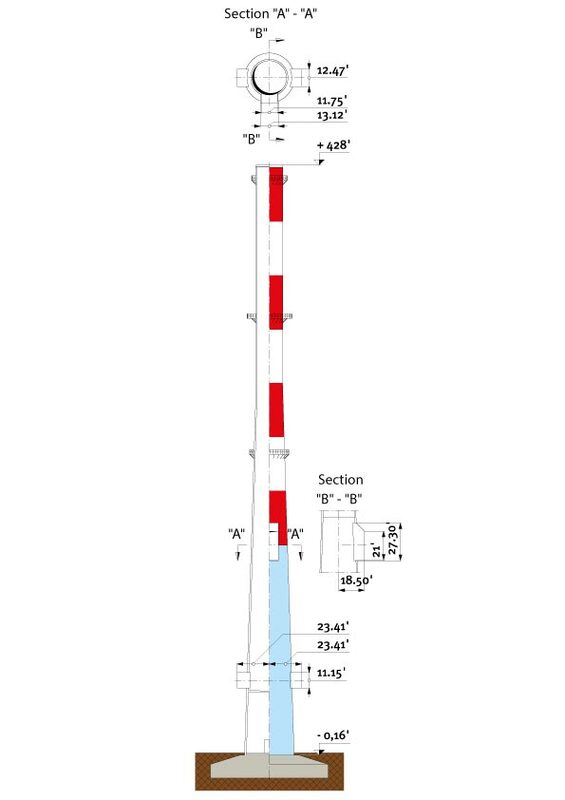 In addition to significant savings in construction cost, the New Chimney Design is also lighter than conventional chimneys that use internal flues. This makes the design inherently safer during earthquakes.The Colbun and Bocamina project sites are exposed to considerable earthquake risk. The designers found that by using the New Chimney Design, they could meet the stringent Chilean seismic codes at a reasonable cost. 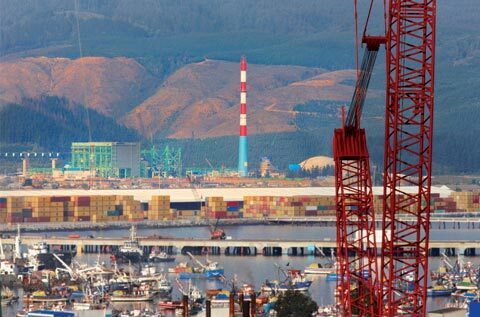 The very strong, Magnitude 8.8 earthquake that hit the region around Concepcion on 27 February 2010 did not result in any significant damage to the Colbun and Bocamina chimneys. As reported on the following pages, Hadek sent a team of experts to Chile to perform a close-up inspection of both chimneys. The Colbun and Bocamina chimneys are located near Concepcion, Chile. 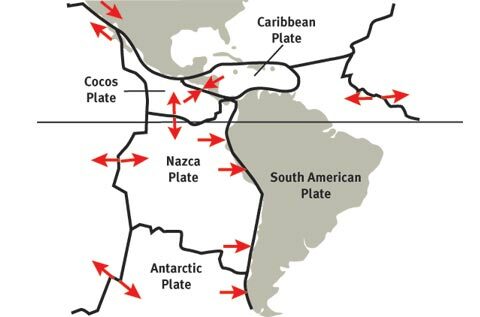 Close to the Chilean coast, under the Pacific Ocean, two tectonic plates, the “Nazca Plate” and the “South America Plate” are slowly and continuously colliding. As a result, the region is exposed to strong earthquakes exceeding 8 on the Richter Magnitude scale approximately once every 15 years. The Chilean authorities place strict demands on the seismic resistance of any building or industrial structure in the country. The Colbun and Bocamina chimneys were designed in accordance with Chilean code NCh 2369. Furthermore, a seismic design review process was carried out by a team under Chilean specialist Professor Ernesto Cruz, who had been appointed jointly by the owners and the EPC contractor. 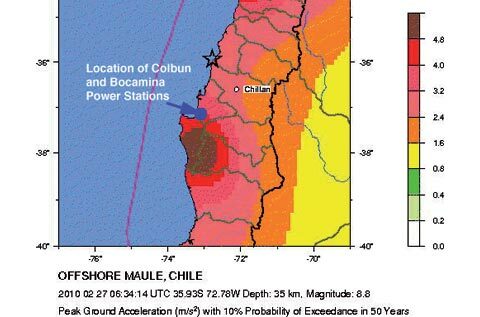 After both the Colbun and Bocamina chimneys and their PennguardTM lining had been installed, a massive earthquake hit Chile at 03:34 on Saturday 27 February 2010. The earthquake measured 8.8 on the Richter scale and was rated by the US Geological Service as the fifth largest earthquake globally since 1900. A monitoring station in Colegio San Pedro, close to the project sites, registered peak ground accellerations of 0,594 G horizontally and 0,571 G vertically. Following the 27 February 2010 earthquake, Hadek commissioned two experts, Dr. John Wilson (Professor of Civil Engineering at Swinburne University of Technology, Melbourne, Australia) and Mr. Markus Rost (Manager of Power Industry Section, Exponent, Düsseldorf, Germany) to travel to Chile and inspect the chimneys for damage. 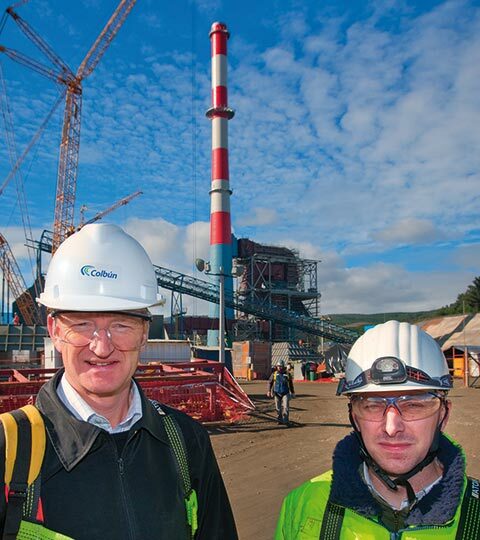 John Wilson and Markus Rost were accompanied by Hadek QA Inspector Johan Lautenbach, who had been involved in the lining installation process for the two chimneys. 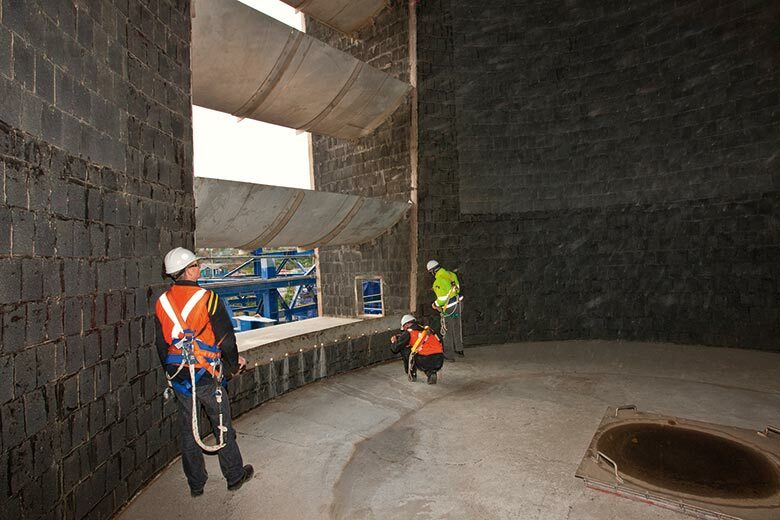 After their arrival in Chile in May 2010, the team first visited Professor Ernesto Cruz to become familiar with the seismic design of the Colbun and Bocamina chimneys. The team then performed site visits and inspected the chimneys, finding that both chimneys were in excellent condition. Any cracks found in the chimneys were narrow and less than 0,2 mm. The PennguardTM linings of both chimneys were also completely intact, except for some localized, minimal cracking near the chimney inlet ducts. 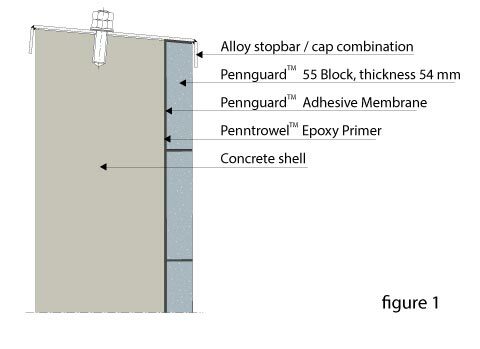 Figure 1 – The PennguardTM lining at the top edge of the chimney is protected by a metallic stop bar. 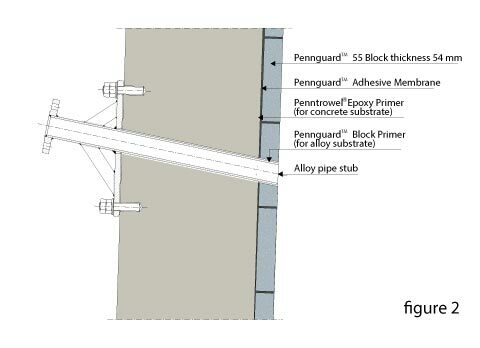 Figure 2 – The pipe stubs of the emissions monitoring equipment extend into the chimney by about 54 mm (the same as the thickness of the PennguardTM lining). 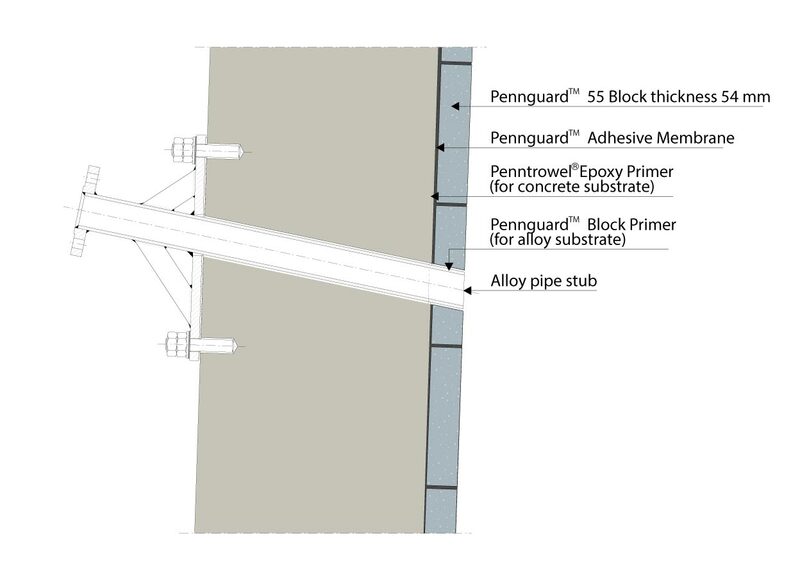 The PennguardTM lining is applied around these pipe stubs by cutting PennguardTM Blocks into shape. Figure 3 – The steel inlet duct is bolted to the concrete shell and the PennguardTM lining overlaps the transition from steel to concrete.